Quickie - Life without Limits. You want cutting-edge wheelchair technology to keep pace with the demands of your active life. For over 25 years, Quickie has listened, researched, tested and delivered. Through state-of-the-art design, superior performance and a customized build, Quickie empowers you to live without limits. 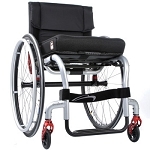 Quickie Folding Aluminum Back, Height Adjustable - 9"-16"